Few matches in world rugby are more hyped than Bledisloe Cup contests between the New Zealand All Blacks and the Wallabies, yet Australian fans have responded to Saturday's first test in Sydney with trepidation and disinterest. Bledisloe Cup matches usually sell out within minutes but many tickets remain unsold for the series opener for a simple reason. Australia hasn't won a Bledisloe Cup series against New Zealand since 2002 and Wallabies fans have little desire to see that streak continue, and little confidence that it won't. The attendance of 54,000 at last year's equivalent match was the lowest for a Bledisloe Cup test in Sydney in the professional era. At the start of the current match week only 45,000 tickets had been sold for the 83,000-capacity Olympic stadium. Rugby Australia chief executive Raelene Castle hoped 60,000 fans will attend and that the stadium "will feel really full." The Wallabies have spent the past week trying to whip up the enthusiasm of their fans by declaring they can match the All Blacks in skill and need only to believe in themselves to win. They have pointed to the fact they won the last match between the teams, 23-18, in Brisbane last October. They say their 2-1 loss to No. 2-ranked Ireland in a tight test series in June is evidence they have turned a corner and are now well-equipped to beat world champion New Zealand. Some have even suggested this season's Super Rugby competition, in which only one Australian team made the eight-team playoffs, points to a broader upswing in the fortunes of Australian rugby. 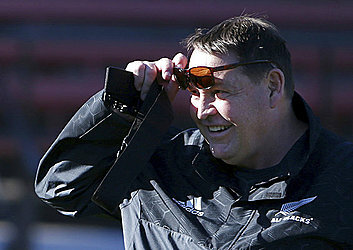 All Blacks coach Steve Hansen responded to the bullish tone of the Wallabies by declaring the hosts favorites for Saturday's match. Unhappy at the prospect of carrying that burden, Australia coach Michael Cheika reclaimed the more comfortable role of underdog. "Hansen's a fine coach. He's leading the team that's the best in the world," Cheika said. "But I think he may have had that one wrong because I don't think many of his players would believe it to be honest." The All Blacks don't shy away from the favorite tag. Their 16-year reign as Bledisloe Cup champions, a little shorter than their reign as the world's top-ranked team, makes that billing inevitable. The New Zealanders swept France 3-0 in their latest series in June and weren't wholly impressive but still managed to induct a number of new players into their squad, broadening their depth. That depth was apparent in the team selections this week. Hansen had a wide range of choices even in a relatively small squad while Cheika, with a larger squad, had fewer. The heart of the Australian team is in the backrow and inside backs: captain Michael Hooper, his fellow loose forward David Pocock, scrumhalf Will Genia, flyhalf Bernard Foley and inside center Kurtley Beale. That group is steeped in experience and, with fullback Israel Folua, will have to rally their younger teammates if Australia is to achieve an upset. The All Blacks can be confident that the Wallabies will have to produce something extraordinary to win. In any reasonable comparison of the teams, there is no area in which Australia has obvious superiority. Hansen has expressed satisfaction with his preparation while trying to keep the public focus on the Australians. "I think they're a good side," he said. "They've done a lot of work on their running lines, their core set-piece roles and their scrum has got better. Looking at it against Ireland, they've quickened up their lineout a lot and obviously their kicking game is good so we're going to have to put a lot of pressure on all those areas to compete."